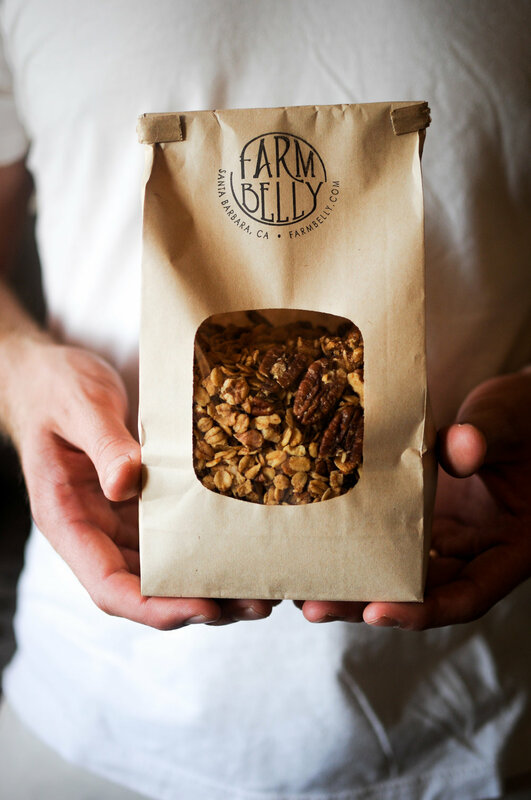 There are a few secrets to making top notch granola. First things first, use olive oil as the liquid fat (as opposed to butter or coconut oil), as olive oil adds a touch of savory to the otherwise sweet, salty, crunchy mix. Next, make sure you don’t overcrowd your baking sheet, or else the granola won’t crisp up properly. Third, make the granola your own! Feel free to use this recipe as a basic guide, and incorporate your favorite nuts, seeds, and spices. This recipe is a mash-up of my two favorite granola recipes: Nekisia Davis’ granola (where I learned the trick to use olive oil), and Flagstone Pantry (where I learned the irresistible combination of orange zest and cardamom). See below for the full recipe. Preheat oven to 300°F and grease two rimmed baking sheets with oil or pan release. In a large mixing bowl, combine the oats, pumpkin seeds, walnuts, pecans, almonds, and coconut flakes. In a small bowl, whisk to combine olive oil, maple syrup, orange zest, vanilla, cinnamon, salt, and cardamom. Add wet to dry ingredients and stir to combine with a rubber spatula. 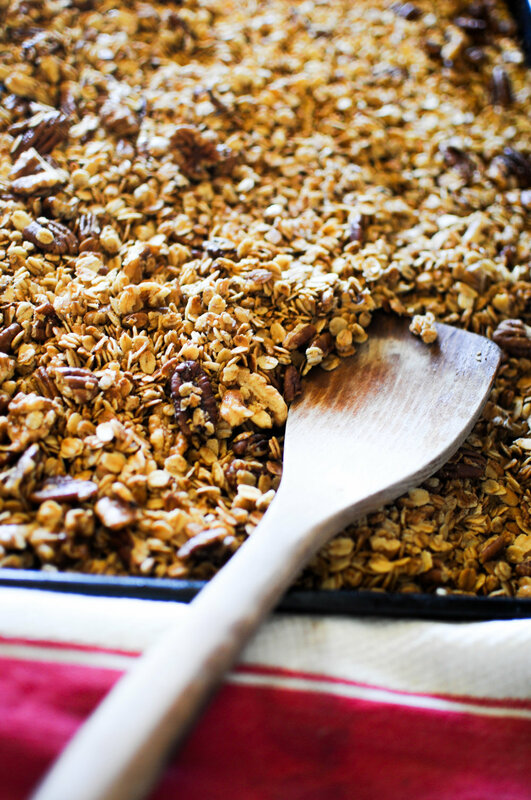 Spread granola mixture in an even layer on two rimmed baking sheets. Transfer to oven and bake, stirring every 10 to 15 minutes, until granola is toasted, about 45 minutes total. Remove granola from oven and top with a few sprinkles of flaky sea salt. Let cool completely before serving (this allows the granola to crisp up). Store in an airtight container for up to 1 month. Bliss balls, energy bites, vegan truffles... whatever you call them, here’s the low-down on how to make these lil plant-based pockets of energy. I like to make a big batch of these truffles and store them in the freezer, and I’ll grab one whenever I need a quick boost of fuel (without the sugar crash an hour later). Keep scrolling for my recipe for Cacao, Cardamom + Orange Zest Energy Truffles… all you need is a food processor and a few key ingredients, and there are endless spice + flavor combinations to customize these truffles to your liking. Dates are a great source of several key vitamins and minerals, and they are high in fiber, which slows the introduction of sugar into the bloodstream and prevents sugar crashes. Dates are also naturally rich in carbohydrates, making them an excellent source of energy. Almonds are an awesome source of healthy fats, fiber, protein, magnesium and vitamin E. Both raw and roasted almonds pack a high dose of nutrients and minerals. Roasted almonds have actually been found to be easier for our bodies to digest, but just try to avoid almonds roasted in excess oils and/or salt. Cacao powder is one of the richest sources of antioxidants found in nature, and is especially high in magnesium and iron. To make cacao powder, cacao beans are milled at low temperature to protect the nutrients and flavor. Separated from the oily cacao butter, cacao powder is also a concentrated form of healthy dietary fiber. Cacao is slightly different from unsweetened cocoa powder - both come from the same cocoa bean, but cocoa power is processed at a higher temperature theremore some of the nutrients are lost during processing. In my opinion, cacao powder is best but can easily be swapped 1:1 with unsweetened cocoa powder (which is typically easier to find in grocery stores). Chia seeds are one of the most digestible plant proteins, an excellent source of fiber, vitamins and minerals. Chia seeds contain all 9 essential amino acids, making it a complete protein that our bodies need to building and repairing tissues and cells in our bodies. Chia seeds are hydrophilic, meaning the seeds actually absorb liquid and form a gel, which make them especially useful as a thickening agent in smoothies, pudding, and overnight oats. The highly digestible protein in hemp also includes all 9 essential amino acids which our bodies cannot produce, making it an complete source of plant-based protein. Hemp seeds are also a plentiful source of fiber, vitamins and minerals. Although it is a 90% saturated fat, coconut oil contains medium-chain fatty acids (MCFAs) that are easier to digest and are converted into energy rather than stored in your body as fat. There are tons of different kinds of coconut oil - I recommend purchasing organic raw unprocessed extra virgin coconut oil. If your dates are dry or still, soak them in hot water for 5 minutes, then drain well and pat dry. Place almonds in a food processor and process until nearly the consistency of almond meal. Next, add the dates and pulse until the dates are in very small pieces and fully combined with the ground almonds. Next add the cacao or unsweetened cocoa powder, coconut oil, hemp seeds, chia seeds, orange zest, vanilla extract, cardamom and a pinch of kosher salt. Pulse to combine, stopping occasionally to push the mixture down, and pulse until very smooth and fully blended. If the mixture is too dry, add a tablespoon of water. Don't rush this part, as it can take up to 2-3 minutes of blending - you want everything to come together in a ball in the food processor. Taste adjust seasoning if needed. Transfer mixture to a bowl and place in the freezer for 15-20 minutes. With a spoon or tablespoon, scoop the mixture and roll into balls - make them as big or as small as you'd like. At this point, you can also roll the truffles around in an assortment of toppings: finely chopped nuts, shredded coconut, cacao powder, etc. Enjoy immediately, or transfer to an airtight container and store in the refrigerator for up to 2 weeks or freeze for up to 2 months.